Makenzies Miracle: Grasp and Release! I just thought that I would give a quick post tonight. Makenzie continues to do really well! She just continues to amaze me! I was talking to her PT yesterday, she was doing a recertification for her services and a paper fell out of her file. It happened to be a recert from almost a year ago. Last year at this time Makenzie was working on getting into ANY position that wasn't a ball without puking. THAT'S IT! Now we are working on rolling, sitting, all fours, standing while holding onto a walker, and so much more! God is so GOOD! If you can't see the Miracle's in that.... you must be blind! In therapy yesterday Makenzie was standing up next to her walker and was holding on with her whole fist open and her thumb all the way around the handle...wow! Her therapist sat her down and asked her to let go and one hand at a time she took both hands off of the walker....wow again. Then when stood up Makenzie was asked to put her hands back on the handle and guess what.... one hand at a time she lifted them both up and opened her hand and placed them on the bar....... HOLY COW! You all should have been here to hear the uproar in my house yesterday morning! I know that most of you don't understand how big this is but it is BIG!! 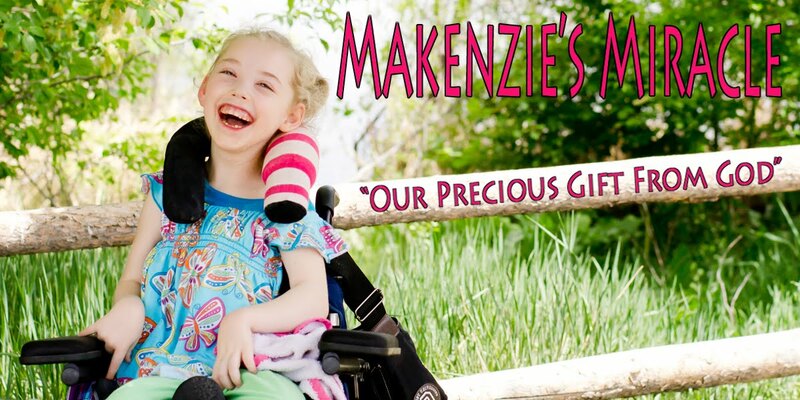 It means that Kenzie knows that her arms are there and now can begin to learn how to use them again! It, as always is slow, but she is healing!!!! Her speech therapist at school is also amazed! She was telling me yesterday after class that they were singing Old Mac Donald and she got to make the animal sound with a switch and on cue she would push it to make the sound in the song the class was singing...... AMAZING!!!! I am running out of Adjectives! To say the least she gave us all a great Thanksgiving present! She is also sitting much better. She is pushing with her hands and keeping her balance. She is holding her head and trunk up too! She used to sit all folded up and every once in a while she would lift her head. Now she is sitting upright and dropping her head much less! It is so great to see! She is getting so close! Keep praying! God hears us and listens! Remember in this season to also give thanks to what God has done for our family! Thank you and God Bless!